Two British reporters and a translator have been formally charged by a Turkish court with "working on behalf of a terrorist organisation". 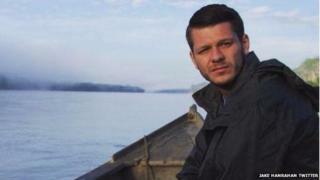 Vice News journalists Jake Hanrahan and Philip Pendlebury were detained by police as they filmed in the south-east region of Diyarbakir on Thursday. Their lawyer told the BBC police interrogated them about alleged links to Islamic State and Kurdish militants. They deny the charges, which Vice News calls "baseless and alarmingly false". The trio had been in the region filming clashes between police and Kurdish militants, Vice News said. Violent exchanges between security forces and youths from the outlawed Kurdistan Workers' Party (PKK) have erupted in recent days. Turkey has limited journalists' access to the region. The two British journalists and their translator were detained on Thursday at their hotel, their lawyer told the BBC. He said they were initially accused of filming a military base nearby without permission. Then the material on their computers and cameras was investigated. The lawyer said the journalists were subject to questions of whether they were working on behalf of the IS or the Kurdish militant group PKK. They denied the accusations, saying they were only doing their job. The Vice News journalists were working in the predominantly Kurdish south-eastern town of Diyarbakır when they were detained, which has seen intense clashes between militants and security forces recently - it's increasingly difficult for journalists to report from the area. Turkey was dubbed as "the biggest prison for journalists" in 2012 and 2013 by journalism organisations. In general though, detained foreign journalists would either be released or deported. The journalists' lawyer told the BBC they had a right to object to the court ruling within a week, but that they do not expect an overturn of the decision. The journalists' lawyer said the trio were detained at their hotel and initially accused of filming a military base without permission. Their camera and computers were seized and investigated, he said. They were then asked questions about whether they had been collaborating with the PKK or the so-called Islamic State group, before being formally arrested by a local court. They have denied all charges. Kevin Sutcliffe, Vice News's head of news programming in Europe, said the Turkish government had levelled "baseless and alarmingly false charges" in an attempt to intimidate and censor its coverage. "Vice News condemns in the strongest possible terms the Turkish government's attempts to silence our reporters who have been providing vital coverage from the region," he said. No further court dates have yet been set.